Shining a Light on Queensland’s Lighthouses! This article, by Dr Shirleene Robinson, was originally published on the Queensland State Archives website, May 2009. In contemporary Queensland, lighthouses are admired for their architecture and spectacular coastal locations. They also appeal to those who appreciate their historical isolation and romantic imagery. For most of Queensland’s history though, lighthouses have played much more than a symbolic role. Queensland has over 5000 kilometres of coastline, much of it in the Great Barrier Reef, the world’s most extensive coral reef system. Over 1800 ships have been wrecked on this coastline. Without lighthouses, this toll would have been much higher. Furthermore, by allowing safe shipping, lighthouses have been central to Queensland’s communication with the rest of the world and its commercial development. An overview of Queensland’s most significant lighthouses shows the integral part that these iconic structures have played in Queensland’s history. The first lighthouse in Queensland was constructed at Cape Moreton at Moreton Bay in 1857, two years before Queensland separated from New South Wales. The waters of Moreton Bay were notoriously dangerous: in 1847, the steamship Sovereign had been wrecked at the South Passage bar, resulting in the loss of 44 lives in Moreton Bay waters. Immigration and shipping records held by Queensland State Archives demonstrate that by the time this lighthouse was constructed, Cape Moreton had become a major shipping passage. Moreover, traffic in these waters was increasing as the region’s immigrant population grew. Keeping a light burning to warn ships of dangers was of considerable importance. The Cape Moreton lighthouse was built from locally obtained sandstone and was constructed by stonemasons, working with convict labourers. It was designed by the famous colonial architect Edmund Blacket. The original source of light for this lighthouse was an oil wick. This was converted to pressurized acetylene gas in 1930, then to 240 volt electricity in 1937 and finally, to solar power in 1993. The lighthouse structure has survived to the present day. By 1864, with the growth of new ports north of Brisbane such as Mackay and Bowen, there was increased marine traffic along Queensland’s coastline. 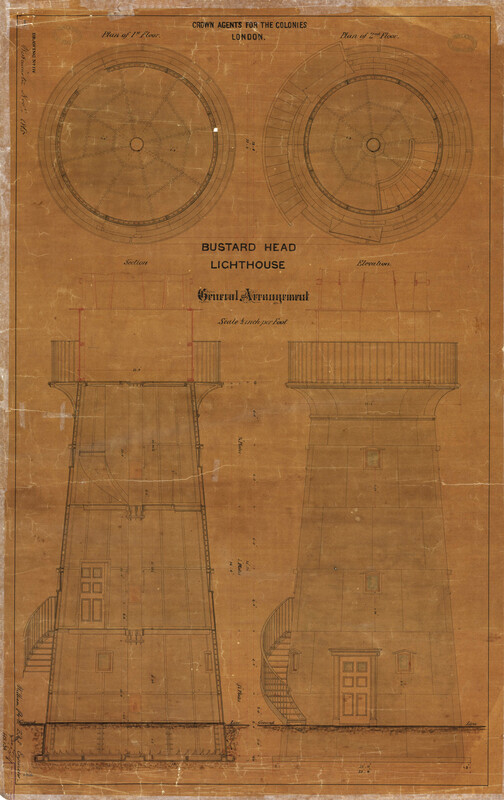 As a result, a government inquiry recommended that lighthouses be constructed at Bustard Head in 1868 and Sandy Cape in 1870. 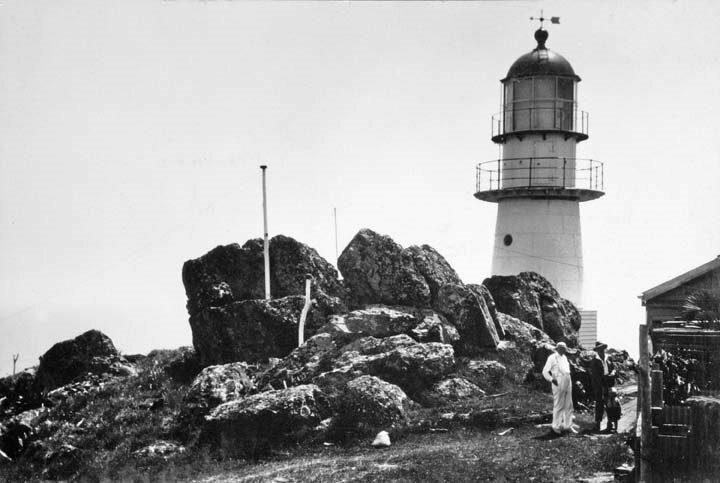 As the first lighthouse built since separation from New South Wales, Bustard Head was particularly significant. The Sandy Cape lighthouse was also important as it was the tallest lighthouse built in Queensland’s history. In 1873, a lighthouse was established at Lady Elliot Island near Bundaberg and it is this lighthouse that set the style that came to characterise colonial lighthouses in Queensland. The eighteen metre tall Lady Elliot Island lighthouse was constructed with a concrete foundation and a hardwood frame. Eighteen gauge galvanised iron sheets, which were imported from England, were then fixed onto the frame. The combination of imported English sheets, along with locally constructed bases and frames, was both climatically appropriate and enduring. The innovations used to build the Lady Elliot lighthouse were duplicated in 14 other lighthouses, including buildings constructed at Cape Capricorn on Curtis Island in 1875, North Reef on the Capricorn Channel in 1878, Low Isles, offshore from Port Douglas in 1878, Cape Cleveland, near Townsville in 1879, and Dent Island, in the Whitsunday Passage, in 1879. Out of all the lighthouses built during the colonial period, the lighthouse at North Reef, about 100 kilometres offshore from Gladstone, was the most difficult to construct. This lighthouse was set on a small sandbank on a coral reef, a particularly desolate location. The lighthouse, which stood at 24 metres, rested on a hollow base that served as a tank, designed to obtain water from the roof of the quarters. The tower and quarters were constructed of timber covered in galvanised iron. Its successful construction stands as a testimony to innovation and ingenuity. Due to its unusual and cramped living quarters though, only single lighthouse keepers were posted to North Reef. Documents held by Queensland State Archives show that other lighthouses did accept keepers with families. There was usually at least one head keeper and two assistants stationed at lighthouses, so quarters were built to house these people. There were also cases of teachers being stationed on lighthouses to instruct children. The individuals who worked at lighthouses usually had one month per year for holidays and most opted to leave their posting for this time. There was a lull in lighthouse construction in the early 1880s, largely due to the fiscal savings measures taken by the McIlwraith government, which assumed power in 1879. By January of 1883 though, it had become evident that the increased traffic near Fraser Island meant a further lighthouse was necessary. As a result, a lighthouse was constructed at Double Island Point, just south of Fraser Island. It was soon followed by another lighthouse at Pine Islet, south-east of Mackay. 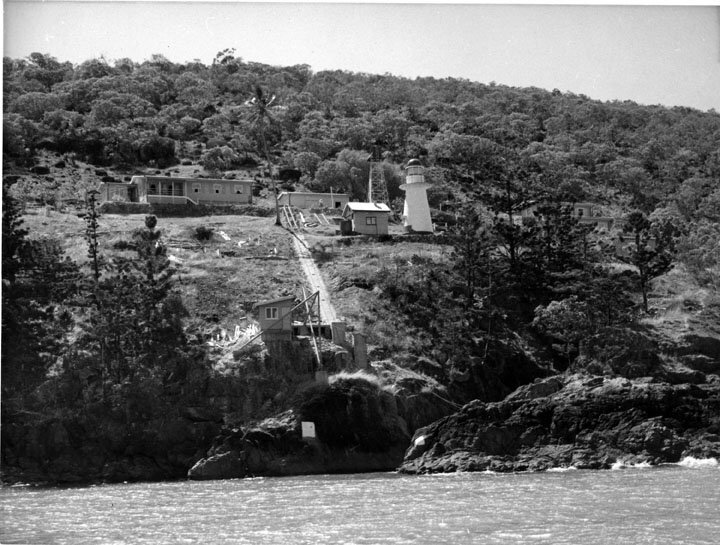 The Pine Islet lighthouse holds special importance as it was the last kerosene-powered lighthouse in Australia. By the late 1880s, it had become increasingly apparent that the Torres Strait required further lighthouses. This area was notorious for shipwrecks in the 19th century, as Queensland State Archives shipping records document. In 1886, a lighthouse was placed at Goods Island, at the western entrance to the Torres Strait. The Goods Island lighthouse was uncommonly small at just over five metres in height and, unusually, was predominantly constructed out of wood. 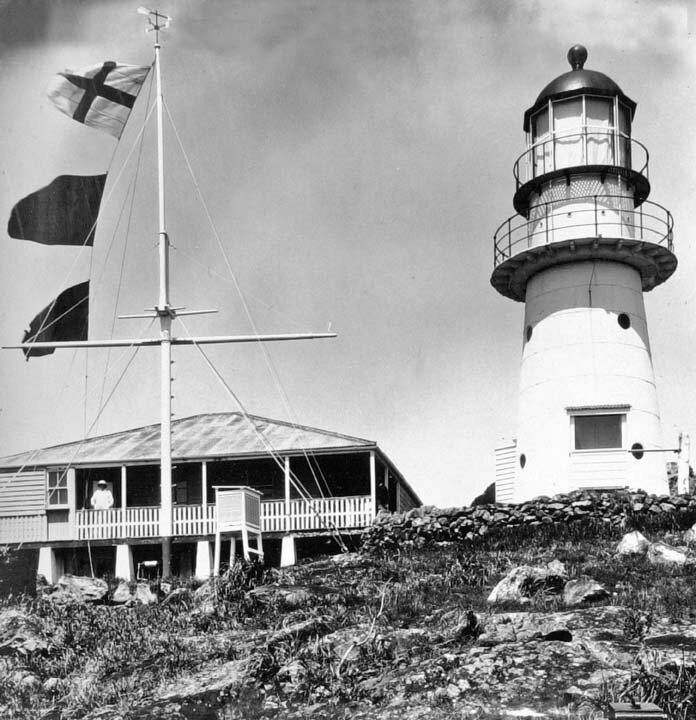 The Goods Island lighthouse was clearly not sufficient to protect ships navigating the hazardous Torres Strait and in 1890, another lighthouse was installed at Booby Island. Prior to the installation of the lighthouse, Booby Island had been so infamous for shipwrecks that sailors had a tradition of leaving goods in caves for those who might be wrecked there. In 1890, George Heath, the chairman of the Queensland Marine Board from 1869 to 1890, retired. Heath’s retirement marked the conclusion of an era of great development. Many of Queensland’s early lighthouses had been built under his direction. Further significant changes to lighthouse development occurred in 1915. On 1 July of that year, the Commonwealth Government assumed responsibility for the lighthouses of the Australian states. By the 1930s, as technology developed, significant numbers of lighthouses were approved and automatic lights were used in increasing numbers. Furthermore, after the Second World War, lighthouses decreased in importance as ships became increasingly dependent on electronic navigational equipment. Moreover, other forms of technology, including wind power and solar power, also impacted on the numbers of keepers employed. By the 1980s, the role of lighthouses had altered significantly. While they were once vital beacons, keeping the oceans safe for immigrants, commercial trade and communication, their role had become increasingly symbolic. In 1996-1997, the Federal Government transferred responsibility for Queensland’s lighthouses back to the Department of Environment and Heritage Management (now Department of Environment and Resource Management). The importance of these iconic structures to Queensland’s heritage has since been recognised, with 10 of Queensland’s lighthouses being listed on the state’s heritage register. Increasing numbers of travellers are also seeking out these historically significant structures that capture the romance and desolation of lighthouse keeping. Hi great story! I hope you don’t mind but I have shared the link to our Facebook page for Lighthouses of Australia. I also have a couple of comments. With North Reef it wasn’t just single Lighthouse Keepers it was just a men only station, a number of the keepers including our father. Also when it came time to taking leave we actually had no choice but to leave the station as a relief keeper would come onto the station and they would normally stay in your house. We had to set up a room for them to sleep in and they had access to the main rooms of the house. You needed to have a lot of trust in them. Booby Island in the Torres Straight did have an actual relief keepers quarters. Thanks Peter for sharing that with us, really helps set the scene of life within a lighthouse! No thank you, really pleased your enjoying our blog! As one who was involved in the upkeep of State controlled navigation aids from the ’60s up to late ’90s, I really appreciated this great article. Well done, our maritime heritage is important. Do you have any information on the (unmanned) lighthouse situated at what is now Tannum Sands, but which in the 1940s when I used to visit it from Boyne Island, was still called Wild Cattle. The light was serviced by a Mr Plumpton, who lived ob Boyne Island (we were only holiday makers from Gladstone). He used to take a few kids with him on his visits to service the light. I remember he would row us across the mouth of the Boyne and then we had to trudge a mile or so along a bush track to get to the light. Mr Plumpton was an Englishman and a WW1 veteran with both his legs badly scarred by mustard gas. Hi Lloyd, thanks very much for sharing your memories and for your question. We’d love to look into this for you, but we need some more information and more space to reply. Please use our online form – https://www.qld.gov.au/dsiti/qsa/request-form – to send your question through to our archivists. my name is wesley anderson,and iam the son of colvin anderson,who was a lighouse keeper on fitzroy island around 1963-1966,and iam trying to get any info on my families time on fitzroy if anyone can help i would really appriciate it regards wesley. Hi Wesley, thanks for your question. We’d love to answer but we need some more information and more space to reply. Please use our online form: https://www.qld.gov.au/dsiti/qsa/request-form to send your question to our archivists. Hi Wesley, I know someone that was on the lights around the same time, he is going to check with his mum. You cane email me directly on braid68@gmail.com if you like. Hi John – unfortunately we don’t hold anything that could help with this question. You might like to contact the National Archives of Australia: http://www.naa.gov.au/ as most of the material regarding lighthouses is held by them. You might also like to try the Local Studies Library in the area or the National Library of Australia’s digitised newspaper database TROVE: https://trove.nla.gov.au/. Good luck with your research.